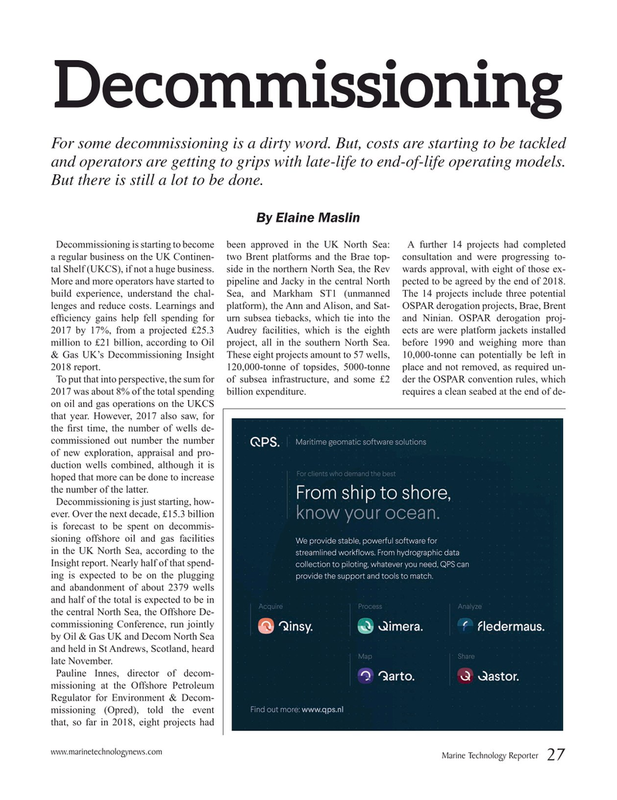 For some decommissioning is a dirty word. But, costs are starting to be tackled and operators are getting to grips with late-life to end-of-life operating models. But there is still a lot to be done. To put that into perspective, the sum for of subsea infrastructure, and some £2 der the OSPAR convention rules, which 2017 was about 8% of the total spending billion expenditure. requires a clean seabed at the end of de- on oil and gas operations on the UKCS that year. However, 2017 also saw, for the ? rst time, the number of wells de- commissioned out number the number of new exploration, appraisal and pro- duction wells combined, although it is hoped that more can be done to increase the number of the latter. Insight report. Nearly half of that spend- ing is expected to be on the plugging and abandonment of about 2379 wells and half of the total is expected to be in the central North Sea, the Offshore De- commissioning Conference, run jointly by Oil & Gas UK and Decom North Sea and held in St Andrews, Scotland, heard late November.